My wife and I and the tiny spoons are leaving for Isla Mujeres, Mexico next week. She's going to the beach, I'm going to the tide pools and reef rocks. In the past the Isome sand worms and Mummy Worms have been the answer in most situations but I'm hoping that a small shiny spoon churning in the foam will get some hits. I recently located some thin stainless steel (Metal By The Foot) to add to the brass and copper I've been experimenting with. Since the spoons will be used on a tenkara rod there is no minimum weight requirement. The small spoon in the photo is next to a .4 gram Daiwa. It's about 10mm long with a size 12 wide eye hook. I've also made a number stainless spoons with the Daiwa as the pattern. Over the last four years I've caught 16 species of fish in Isla Mujeres. I always think I'm about to get it figured out, but there is always a surprise. I can't wait to see what I don't know this year. I look forward to your report. I enjoy seeing the different species that you find in the pools. It will be interesting to see if they hammer the spoons. Have a great and refreshing trip. My wife and I just got back from San Jose del Cabo a few weeks back. All surf fishing on that side. Be careful there's been an exponential increase in crime since last year even in the Baja. As last year, I’ll be waiting for your fish photos of new species to help identify! Last year was a challenge, especially the ones from Florida. Wish I was going - have fun!! I'm taking the Kiyotaki 18, the Soyokaze 27, the Kiyose 33SF and 43MF and the Tenkarabum 40. 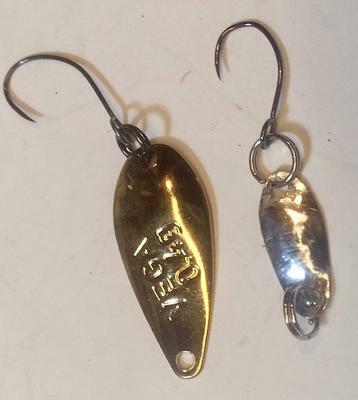 The 18 will be rigged for true micros with a short line and very small hook. The Soyokaze is a perfect match for one particular hole between two rock formations. This hole is a like an aquarium and can easily produce a half dozen different species of fish on any given day. The rest of the time I'm tossing bait and shot in more open areas. Because of the high winds and strong currents I sometimes double up on the shot so strong keiryu rods fit the bill. The TBum 40 is going to be the spoon rod and this trip's new project. In the past I've taken some 5 and 6 meter rods thinking big water =big rods. The fact is the high winds and extremely rocking shore make them impractical. I'm mostly climbing onto a rock and casting between other rocks for trout sized fish at tenkara distances.